Horizon is a web-based, customizable home inspection solution with tools for reporting, scheduling, marketing, field data collection, and more. 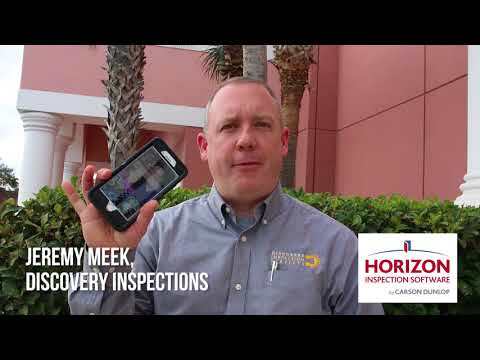 Designed by home inspectors, for home inspectors, Horizon provides an all-in-one platform for planning, carrying out, and analyzing home inspections for agents and buyers. Utilizing the calendar tool, agents and buyers can schedule home inspections online from the self-service portal with third party integrations for automatic recording and double booking prevention. Users can view their daily, weekly, or monthly schedule at a glance and track completed, upcoming, or cancelled bookings for each day, with indicators for tentative and confirmed bookings. Contracts can also be read and accepted by clients during the inspection booking process and payments can be handled directly within Horizon. The reporting module of Horizon provides users with the tools to create customized, interactive reports to record inspection results, monitor sales, track agent activity, and send results to clients. To aid with report writing, Horizon includes tools such as speed writing, search functionality, report templates, and more. Interactive content, photographs, illustrations, and related articles can also be added to inspection reports to illustrate and explain findings. We get more inspections because our report looks the most professional! Horizon has been great to work with and the support team is a great help whenever you need him. My other inspectors all love it as well and we have brief experimental moments with other software platforms, but always keep coming back complaining about the others. It's easy to navigate, easy for me to track my business, and allows great access options to I can monitor and check on my other inspectors work.The best thing about Horizon is the interface and the report appearance when the clients get it. When other inspectors are out there putting word documents together or excel sheets with a couple of pictures at the end they can't even come close to comparing. With Horizon we provide a 40-60 page report with 80-100 digital pictures that takes about the same amount of time as them putting together a word document that makes a bad impression on the client and the realtor along with anyone else that sees it. Combine a great inspection, with outstanding customer service and a report that will impress all on its own and we have a template for success in this business, and in fact, we grow about 20% every year. The best thing about Horizon is the interface and the report appearance when the clients get it. When other inspectors are out there putting word documents together or excel sheets with a couple of pictures at the end they can't even come close to comparing. With Horizon we provide a 40-60 page report with 80-100 digital pictures that takes about the same amount of time as them putting together a word document that makes a bad impression on the client and the realtor along with anyone else that sees it. Combine a great inspection, with outstanding customer service and a report that will impress all on its own and we have a template for success in this business, and in fact, we grow about 20% every year. I'm picky because I work with it every day and after comparing the other software products there are a few things I wish was better. One was for more picture storage (you get like 200) but for those 4 families and such more would be better. Also we need a scroll bar for preset canned statements in the tablet/OS version like the PC version has. Lastly I would like to see more options for picture editing and flagging pictures. Great to hear from Inspection Professionals like you Matthew and much appreciated! And congratulations on your growing business! Horizon stores all inspection photos, report items, comments, communications, and more for you. Increasing the storage capacity was a big hit with Horizon Inspectors. Photo limit is a little low Since it is internet based it does slow down from time to time and/or makes it difficult to write the report on site if inspection is in an out of service area. Hi Alex, thanks for your review. We're glad that Horizon is helping you grow your business and we always invite any comments for improving our product. We also have some terrific news for you. We just increased the photo limit to 200,. One of the many benefits of being a Horizon user is that we continuously provide updates. And your comments help us do just that. I'm overall very pleased. Good group of user helps when tweaking narratives. Support has always been quick and responsive.Horizon has never let me down. It's robust platform has never left me without the means produce a report. Horizon has never let me down. It's robust platform has never left me without the means produce a report. Page breaks can make reading the report awkward. There is a solution but I find it a bit of a bandaid type of solution. And it adds time to the reporting process. Thanks Mark, we appreciate your feedback. Our new Report Designer allows you to manage those breaks. We spent a considerable amount of time and effort on developing this new feature. We encourage you to have a look at the following information to learn a bit more about Report Designer. I have used Horizon for over 6 years now, and while I have looked at a few other software providers, none has shown me any reason to move away from Horizon. I would (and do) recommend Horizon to my colleagues.Horizon is pretty progressive - I find it intuitive to use and constantly improving. Horizon is pretty progressive - I find it intuitive to use and constantly improving. The final look of the report could use some updating, and I believe Horizon is working on that constantly. Thanks Leigh! We are constantly working on introducing more flexibility to our reports and with the new Report Designer, you can take complete control over the appearance and presentation of your inspection reports. My experience with Horizon is that the software is design and developed by inspectors for inspectors, with the home buyer and realtor in mind. It's truly a remarkable way of doing things.My clients love it! It's consumer friendly! My realtors love the ACTION List and all the hyper links. The buyers say that's it's easy to understand. My clients love it! It's consumer friendly! My realtors love the ACTION List and all the hyper links. The buyers say that's it's easy to understand. There's nothing I don't like about it. If there's an issue they address it promptly. Thank you for your recent review on Capterra! We enjoyed reading your review and appreciate your honest and professional feedback. There is so much industry history with our staff and company in and hearing stories like yours it's truly amazing. I shared your appreciation with our team. Monthly and Annual Subscriptions Available. Inspection Credit Plan Options Available. Create interactive reports by generating a checklist of items and converting into concise, professional reports with color illustrations, photographs, videos, and more. Benefit from 1000’s of reference articles, photos, and other support material within the Horizon knowledge database which can be added to reports as references to expand upon data and enhance credibility. Plan inspections or allow agents and buyers to view availability and schedule their own inspections using the integrated scheduling and self service tools. Inspectors can view their daily schedule and upcoming appointments at a glance using the calendar tool. Promote the business and automate marketing with Horizon's Marketer tool which allows users to create and schedule customized email marketing content such as thank you emails, referral requests, promotions, newsletters, and more. Generate contracts and send them to clients via email for acceptance during the booking process, and process client payments online within Horizon to ensure no payments are missed. Below are some frequently asked questions for Horizon Software. Q. What type of pricing plans does Horizon Software offer? Q. Who are the typical users of Horizon Software? Q. What languages does Horizon Software support? Q. Does Horizon Software support mobile devices? Q. Does Horizon Software offer an API? Yes, Horizon Software has an API available for use. Q. What other apps does Horizon Software integrate with? Q. What level of support does Horizon Software offer?